Summary: Everyone knows about the Boston Tea Party, but it turns out that event was just the beginning. 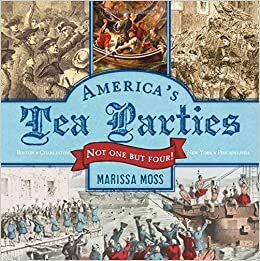 After word got around to the other colonies, Sons of Liberty groups in Charleston, New York, and Philadelphia had their own tea parties to prevent British tea from getting into colonial shops and to protest the hated tax on tea. The four tea parties are put into context with a thorough look at the events leading up to them, as well as the various players in each colony. Plentiful illustrations and sidebars add even more information. End matter includes a six-page author’s note, a timeline covering events from fall of 1773 to the end of 1774, an extensive bibliography, and an index. 48 pages; grades 3-7. Pros: Middle grade social studies curricula will be given a boost with this well-written history of the period leading up to the American Revolution. Thorough research, an engaging writing style, and plenty of illustrations make this an excellent nonfiction choice. Cons: There’s a lot of information here for the average fifth or sixth grader to wade through.